See you on the next wave. UC Hastings graduates are legal professionals with a clear sense of the social, economic, business, and cultural contexts in which the law is applied. That sense, along with their passion for both the theory and the practice of the law, makes them unparalleled advocates for their clients, regardless of whether those clients are entrepreneurs or immigrants, inventors or entertainers, the high and mighty or the average citizen. A UC Hastings education starts with a firm grounding in the fundamentals — tort law, criminal law, civil procedure — and builds on that foundation with a choice of nine interdisciplinary concentrations, where you can gain career-specific experience in areas like the health sciences, social justice and international law. With such a diverse, “living” legal education, it’s no surprise that UC Hastings graduates not only thrive in traditional legal careers, but find crossover success as health care policymakers, bioethics experts, international human rights advocates, digital media entrepreneurs and much more. Co-taught by Professors Alina S. Ball and Manoj Viswanathan, this live-client course is concerned exclusively with transactional tax issues — giving students the opportunity to apply what they’ve learned in the classroom to real world issues. Students in the Startup Legal Garage provide corporate and intellectual property work to early stage startup companies under the supervision of leading attorneys throughout the Bay Area. The Medical-Legal Partnership for Seniors Clinic is an innovative, award-winning clinic at UC Hastings. The clinic partners with UCSF and the San Francisco VA Medical Center to provide advance health care, estate planning, public benefits, and wrap-around legal services to older adult patients. Our curriculum cultivates an enthralling and thought-provoking intellectual environment, inspiring great minds from around the world to share their knowledge and expertise through guest lecture series for our students and faculty. 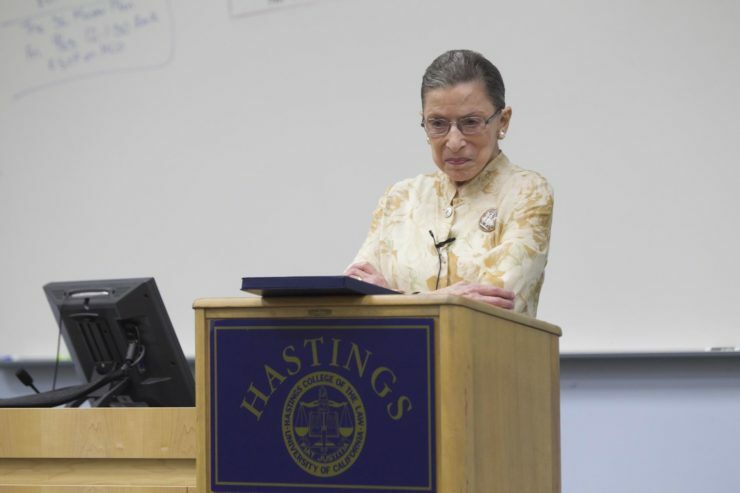 U.S. Supreme Court Associate Justice Ruth Bader Ginsburg visited UC Hastings for a conversation with Professor Joan C. Williams that touched on a broad range of subjects, from opera to marriage to work/life balance, doctrinal questions, and cases from the 1970’s to present, including the court’s role in establishing individual rights and equal protection.